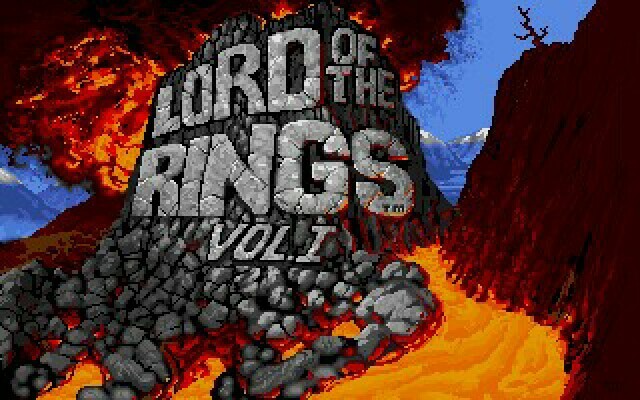 If you have played the floppy version of LOTR keep in mind the enhanced version contains 20 minutes of footage from Ralph Bakshi's animated version of The Lord of the Rings. 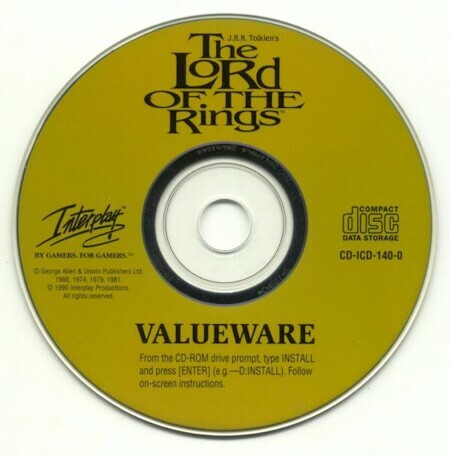 The CD version also includes a nice stereo CD soundtrack that could not fit onto the floppy version. Without a doubt, J.R.R. Tolkien's The Lord of the Rings is the basis for the popularity of modern fantasy, both in fiction and in role-playing games (RPG's). Drawing on myths, legends, folklore, and his own vivid imagination, Tolkien created a fantasy world that people could easily care about. Tolkien's work inspired a host of imitations in both the literary and gaming worlds; but while literary imitations have ranged from the horrendous to the very good, games have almost universally failed to reflect the care that went into Tolkien's work. Today's crop of spin-offs from Peter Jackson's movies are no exception. I find their relentless combat and Pavlovian arcade style offensive and contrary to the books. The opposite is true in Interplay's The Lord of the Rings, a forgotten classic from 1990, and that's why it is undeniably special, even today. 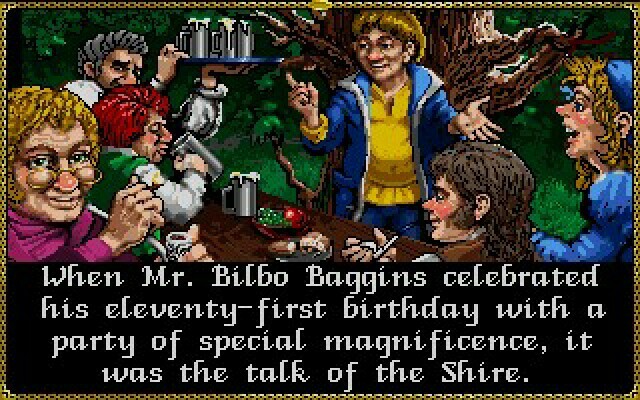 Unlike other computer games based on Tolkien's world, Interplay focused on recreating the detail and communicating the sheer love that went into the written work. In the process, this game also managed to take a completely fresh approach to the nature of computer role-playing games. Both accomplishments are worthy and welcome. Like most Interplay games of the era, the interface is easy to use and the graphics are strong. You see the members of the fellowship trudging from place to place as you cross bridges, enter buildings, and climb hills in realistically rendered settings. From the map screen you can bring up the options menu, where you can load and save games, pause the action, stop the music, or quit the program. If you want the real stuff to happen, though, you must press the space bar and bring up the character menus. From the character menu you can view the character's stats, cast magic spells, equip or trade items, talk to characters, use inventory items, or change leaders. Each action requires a single keystroke, which either does nothing or yields another menu. From this nested menu, another single keystroke accomplishes the action. Simple and elegant, the system handles some surprisingly complex situations. You also use this nested menu to engage in combat. Conducting battle is simply a matter of moving each character into position and either casting spells or attacking with fists, knives, swords, or axes. You lose life points when you're hit, and your enemy loses them when you hit him. It's all very simple, and very easy to use. And this is, of course, in keeping with the Tolkien books. The current crop of games want combat regularly, but in Tolkien's trilogy it doesn't happen much at all. In Interplay's adaptation, as in the trilogy, combat is quite rare. It's possible to travel a long while without engaging in combat, and most fights are those you've sought yourself. In many cases, you can avoid combat by uttering the right password or showing the right item — and it's almost always better to do so. Unlike most fantasy PPG's, The Lord of the Rings doesn't link gaining items with defeating enemies, so you can collect important artifacts without going through the ritual of battling foes. Monsters in this game don't carry treasure chests. For that matter, there aren't many monsters. You don't encounter 12 rabid rats, 6 zombies, or 8 Balrogs. Instead, you encounter a couple of wolves, an orc or two, the occasional human, and sometimes, and only when and where appropriate, magical creatures like barrow-wights and wizards. The effect of in-frequent combat is that the story carries far more suspense than you find in other fantasy PPG's. Another effect is that, once again, Interplay has captured the pace and feel of Tolkien's original trilogy. The secret formula for Interplay's success, though, is attention to detail. You begin the game as Frodo, with Sam and Pippin standing with you in front of your hobbit-hole, Bag End. Before the game even starts, however, you're given a colorful summary of the first two chapters of Tolkien's book, and all details are accurate. Then you begin your journey, and nothing is omitted. In the Shire itself, for instance, you don't meet generic hobbits — you meet Lobelia, the Gaffer, and Farmer Maggot. Get through the Old Forest and you find Tom Bombadil and Goldberry, and in Bree you meet up with Strider and Barliman Butterbur. Bilbo, Arwen, and Elrohir await you in Rivendell, and you even come across Glorfindel on the road. Interplay's adaptation also shines in its enhancements to Tolkien's story. Not wanting to put off a generation of Tolkien fans, the designers decided to add, very carefully, adventures not contained in the trilogy. Carefully is the key word here: Every added episode is either hinted at in the novels or clearly would have been possible in the Tolkien scheme. In the Shire, for example, you meet the dwarf Druin, and in Buckland you come across Athelwyn the elf. Both will join your party, yet neither appears in the trilogy. Also in the Shire, you can take on several minor quests, ranging from finding a lost dog to rescuing two lost children among the ruins of the East Woods. After passing through the maze of the Old Forest you come across Bombadil, but you also meet the spirit of Withywindle the stream, and seek the aid of Ruddyoaks the tree. Both Withywindle and Ruddyoaks are discussed in the trilogy, but the game cleverly brings them to life. When Ruddyoaks joins your party, in fact, you are experiencing first-hand a bit of Tolkienesque magic. Truly excellent stuff. Other clever side-adventures follow. A major addition to the plot involves the recovery of the Golden Wheel, a dwarfish artifact that's important for success. This plot, linked to the nature of the dwarves and Moria, is not in the trilogy, but it's appropriate to and very well-handled in the game. Little touches abound as well, such as Bilbo following you to the library in Rivendell and helping you find some essential scrolls. This is exactly the kind of thing Bilbo might have done, since he was fascinated by books and served as a constant source of information for Frodo. The first part of this game takes place in the Shire and Buckland. Once through the many different adventures here, including a meeting with Gildor the Elf and a few other more surprising characters, the party must find its way through the Old Forest. The maze here is quite frustrating, but certainly no more than it was for the characters in the book. Past the Old Forest is Tom Bombadil's house, and after a series of fairly complex adventures, it's off to the event-filled Barrow-Downs. Eventually you'll find yourself lost in the fog, and when you emerge, you'll almost certainly be face to face with Sharkey's Shipping Store and the under-ground adventures that await you there. Then it's off to Bree, and eventually to Rivendell and beyond. This game takes you approximately to the end of the first volume of Tolkien's trilogy, and gives full treatment to all the major events that take place in the novel. This game is a treasure for Tolkien fans. While no game can possibly capture the novels' sheer drawing power, Interplay's designers have done everything possible to capture the spirit of the books. And, faithful to the original work, they've minimized combat and maximized wonder, something long overdue in the fantasy PPG genre. If all goes well, playing this game will actually enhance your reading of the books, and there's nothing more you can ask.